Wormwood has a long history in both herbal medicine and the liquor industry. It contains sesquiterpene lactones (absinthin) that make it extraordinarily bitter but make it ideal as a digestive tonic for various forms of indigestion. It is sometimes classified as an aromatic bitter because it also has high amounts of essential oils that impart a carminative action that relieves colic and gas. In the German herbal tradition, it is often used specifically for gallbladder disorders including biliary colic, cholestasis, and gallstones. The infamous liquor Absinthe contains high amounts of wormwood and has been banned or altered in most western countries. 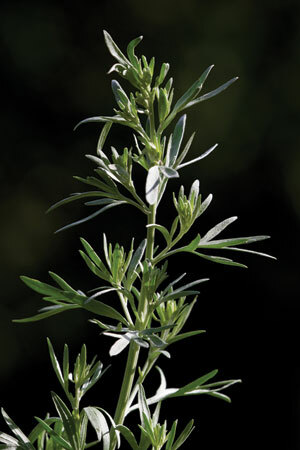 Wormwoods contains high amounts of thujone, a neurotoxin that when consumed chronically in high amounts alters mood and causes mental disturbances. As the name implies, wormwood is used as an anthelmintic and vermifuge to treat worm infestations of the gastrointestinal tract, but its antimicrobial properties are not just limited to worms. Also, research studies show it possesses antibacterial, antifungal, antiparasitic and antiviral properties, making it a useful broad-spectrum antimicrobial. Moreover, recent research has revealed it also has some anti-inflammatory properties, which may help patients who have Crohn's disease stay in remission.